Orthodox allergy testing is not sufficiently accurate to identify all allergies. 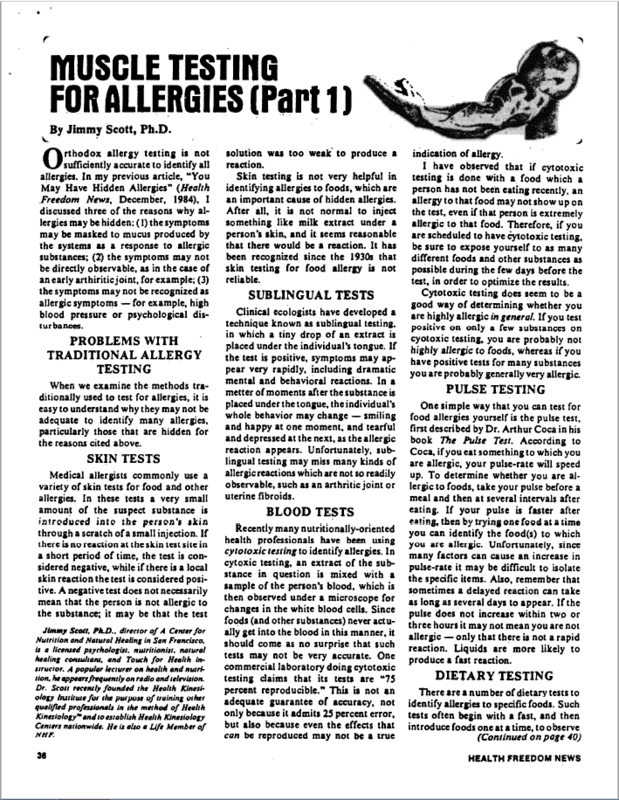 In my previous article, “You May Have Hidden Allergies” (Health Freedom News, December, 1984), I discussed three of the reasons why allergies may be hidden: (1) the symptoms may be masked to mucus produced by the systems as a response to allergic substances; (2) the symptoms may not be directly observable, as in the case of an early arthritic joint, for example; (3) the symptoms may not be recognized as allergic symptoms — for example, high blood pressure or psychological disturbances. When we examine the methods traditionally used to test for allergies, it is easy to understand why they may not be adequate to identify many allergies, particularly those that are hidden for the reasons cited above. Medical allergists commonly use a variety of skin tests for food and other allergies. In these tests a very small amount of the suspect substance is introduced into the person’s skin through a scratch of a small injection. If there is no reaction at the skin test site in a short period of time, the test is considered negative, while if there is a local skin reaction the test is considered positive. A negative test does not necessarily mean that the person is not allergic to the substance; it may be that the test solution was too weak to produce a reaction. Skin testing is not very helpful in identifying allergies to foods, which are an important cause of hidden allergies. 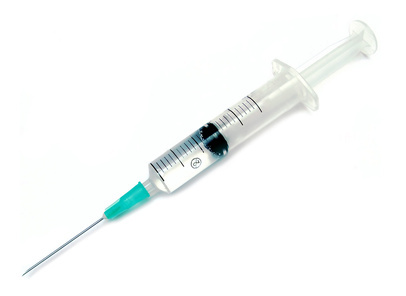 After all, it is not normal to inject something like milk extract under a person’s skin, and it seems reasonable that there would be a reaction. It has been recognized since the 1930s that skin testing for food allergy is not reliable. Clinical ecologists have developed a technique known as sublingual testing, in which a tiny drop of an extract is placed under the individual’s tongue. If the test is positive, symptoms may appear very rapidly, including dramatic mental and behavioral reactions. In a matter of moments after the substance is placed under the tongue, the individual’s whole behavior may change — smiling and happy at one moment, and tearful and depressed at the next, as the allergic reaction appears. Unfortunately, sublingual testing may miss many kinds of allergic reactions which are not so readily observable, such as an arthritic joint or uterine fibroids. Recently, many nutritionally-oriented health professionals have been using cytotoxic testing to identify allergies. 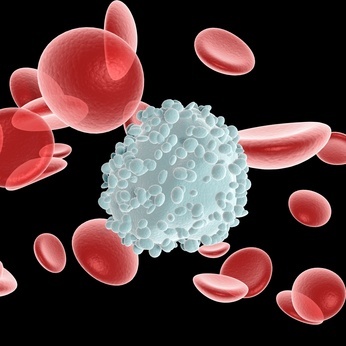 In cytoxic testing, an extract of the substance in question is mixed with a sample of the person’s blood, which is then observed under a microscope for changes in the white blood cells. Since foods (and other substances) never actually get into the blood in this manner, it should come as no surprise that such tests may not be very accurate. One commercial laboratory doing cytotoxic testing claims that its tests are “75 percent reproducible.” This is not an adequate guarantee of accuracy, not only because it admits 25 percent error, but also because even the effects that can be reproduced may not be a true indication of allergy. I have observed that if cytotoxic testing is done with a food which a person has not been eating recently, an allergy to that food may not show up on the test, even if that person is extremely allergic to that food. Therefore, if you are scheduled to have cytotoxic testing, be sure to expose yourself to as many different foods and other substances as possible during the few days before the test, in order to optimize the results. Cytotoxic testing does seem to be a good way of determining whether you are highly allergic in general. If you test positive on only a few substances on cytotoxic testing, you are probably not highly allergic to foods, whereas if you have positive tests for many substances you are probably generally very allergic. One simple way that you can test for food allergies yourself is the pulse test, first described by Dr. Arthur Coca in his book The Pulse Test. According to Coca, if you eat something to which you are allergic, your pulse-rate will speed up. To determine whether you are allergic to foods, take your pulse before a meal and then at several intervals after eating. If your pulse is faster after eating, then by trying one food at a time you can identify the food(s) to which you are allergic. Unfortunately, since many factors can cause an increase in pulse-rate it may be difficult to isolate the specific items. Also, remember that sometimes a delayed reaction can take as long as several days to appear. If the pulse does not increase within two or three hours it may not mean you are not allergic — only that there is not a rapid reaction. Liquids are more likely to produce a fast reaction. There are a number of dietary tests to identify allergies to specific foods. Such tests often begin with a fast, and then introduce foods one at a time, to observe whether there are any allergic reactions. A variation on this approach, if you are suspicious of a particular food, is to eliminate that food and related food, from your diet for about two weeks, then eat a lot of it and see if you get a reaction. Two kinds of reactions may occur. First, you may observe withdrawal symptoms on eliminating the food from your diet. Withdrawal symptoms, which can vary as much as allergic symptoms themselves, generally indicate that you are strongly allergic to the food. Secondly, you may observe a pronounced reaction when you reinstate the food. This technique of withdrawing a food and then challenging the system by reintroducing it was first developed by Dr. Theron Randolph, a pioneer in the field of clinical ecology. This method, described in An Alternative Approach to Allergies by Dr. Randolph and Dr. Ralph Moss, has proven a very effective alternative to traditional skin testing, not only for identifying food allergies, but also for allergies to other substances such as dust, molds, and chemicals. It is possible, however, that you can be allergic to a food or other substance and still show no obvious reaction on eliminating or reintroducing it. One reason is that you may be having a reaction which you cannot directly observe. Moreover, you may have a noticeable reaction, but it may be due to a cause other than ellergy, as I will discuss later in this article. If all the usual methods of allergy testing have their shortcomings, how can we reliably identify allergies? A new set of techniques, using muscle testing, is now being employed to identify allergies with great sensitivity and accuracy. These techniques use the body itself as a sensitive instrument to detect the imbalances that lie at the heart of allergic problems. To understand how muscle testing works, we must first introduce a new concept of allergy. The Medical Model: antigen and antibody. According to the traditional medical view, allergy develops as a result of repeated or excessive exposure to a specific substance, or antigen. In response to this substance, the body produces proteins known as antibodies which specifically match the antigen in question. When the body is exposed to a certain antigen, it produces huge quantities of the corresponding antibody, which lock onto the antigen molecules, triggering chemical reactions in the body’s cells to disable or destroy the antigen. It is these chemical reactions which are responsible for allergic reactions such as swelling, pain, itching, redness, or the secretion of mucus. 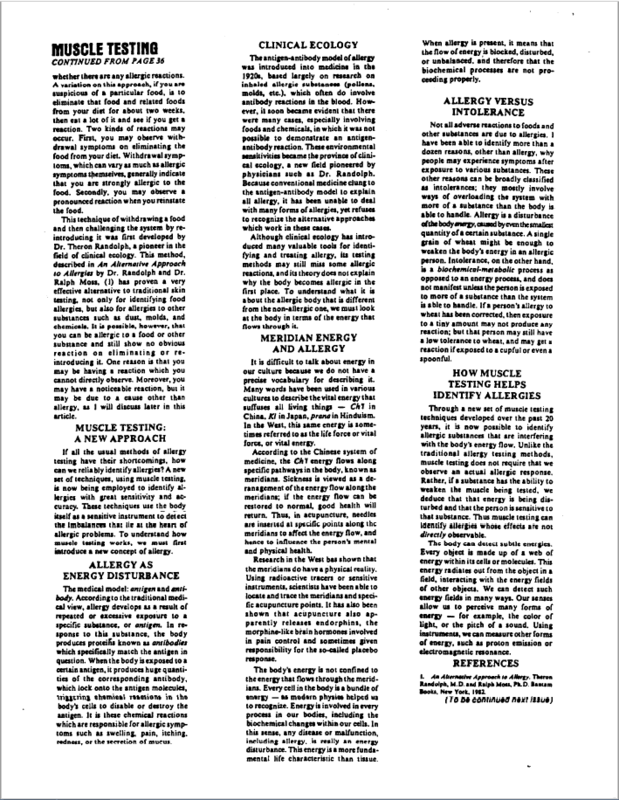 The antigen-antibody model of allergy was introduced into medicine in the 1920s, based largely on research on inhaled allergic substances (pollens, molds, etc. ), which often do involve antibody reactions in the blood. However, it soon became evident that there were many cases, especially involving foods and chemicals, in which it was not possible to demonstrate an antigen-antibody reaction. These environmental sensitivities became the province of clinical ecology, a new field pioneered by physicians such as Dr. Randolph. Because conventional medicine clung to the antigen-antibody model to explain all allergy, it has been unable to deal with many forms of allergies, yet refuses to recognize the alternative approaches which work in these cases. Although clinical ecology has introduced many valuable tools for identifying and treating allergy, its testing methods may still miss some allergic reactions, and its theory does not explain why the body becomes allergic in the first place. To understand what it is about the allergic body that is different from the non-allergic one, we must look at the body in terms of the energy that flows through it. It is difficult to talk about energy in our culture because we do not have a precise vocabulary for describing it. Many words have been used in various cultures to describe the vital energy that suffuses all living things — Ch’i in China, Ki in Japan, prana in Hinduism. In the West, this same energy is sometimes referred to as the life force or vital force, or vital energy. According to the Chinese system of medicine, the Ch’i energy flows along specific pathways in the body, known as meridians. Sickness is viewed as a derangement of the energy flow along the meridians: if the energy flow can be restored to normal, good health will return. Thus, in acupuncture, needles are inserted at specific point along the meridians to affect the energy flow, and hence to influence the person’s mental and physical health. 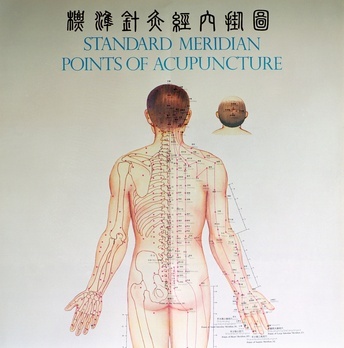 Research in the West has shown that the meridians do have a physical reality. Using radioactive tracers or sensitive instruments, scientists have been able to locate and trace the meridians and specific acupuncture points. It has also been shown that acupuncture also apparently releases endorphins, the morphine-like brain hormones involved in pain control and sometimes given responsibility for the so-called placebo response. The body’s energy is not confined to the energy that flows through the meridians. Every cell in the body is a bundle of energy — as modern physics helped us to recognize. Energy is involved in every process in our bodies, including the biochemical changes within our cells. In this sense, any disease or malfunction, including allergy, is really an energy disturbance. This energy is a more fundamental life characteristic than tissue. When allergy is present, it means that the flow of energy is blocked, disturbed, or unbalanced, and therefore that the biochemical processes are not proceeding properly. Not all adverse reactions to foods and other substances are due to allergies. I have been able to identify more than a dozen reasons, other than allergy, why people may experience symptoms after exposure to various substances. These other reasons can be broadly classified as intolerances; they mostly involve ways of overloading the system with more of a substance than the body is able to handle. Allergy is a disturbance of the body energy, caused by even the smallest quantity of a certain substance. A single grain of wheat might be enough to weaken the body’s energy in an allergic person. Intolerance, on the other hand, is a biochemical-metabolic process as opposed to an energy process, and does not manifest unless the person is exposed to more of a substance than the system is able to handle. If a person’s allergy to wheat has been corrected, then exposure to a tiny amount may not produce any reaction; but that person may still have a low tolerance to wheat, and may get a reaction if exposed to a cupful or even a spoonful. Through a new set of muscle testing techniques developed over the past 20 years, it is now possible to identity allergic substances that are interfering with the body’s energy flow. Unlike the traditional allergy testing methods, muscle testing does not require that we observe an actual allergic response. Rather, if a substance has the ability to weaken the muscle being tested, we deduce that that energy is being disturbed and that the person is sensitive to that substance. Thus muscle testing can identify allergies whose effects are not directly observable. The body can detect subtle energies. Every object is made up of a web of energy within its cells or molecules. This energy radiates out from the object in a field, interacting with the energy fields of other objects. We can detect such energy fields in many ways. Our senses allow us to perceive many forms of energy – for example, the color of light, or the pitch of a sound. Using instruments, we can measure other forms of energy, such as proton emission or electromagnetic resonance. 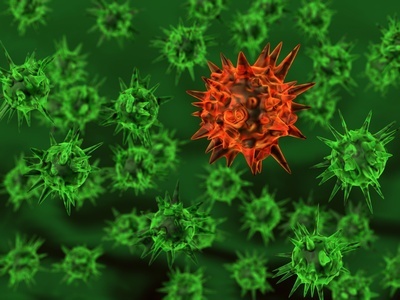 How can this incredibly sensitive instrument, the human body, be used to detect allergies, or disturbances in the body’s energy field? The body’s meridian energy is somehow connected to the muscles of the body. If you are exposed to the energy field of a substance to which you are allergic, it disturbs your energy flow. This energy disturbance is manifested in the form of a weakened muscle. Before doing muscle testing, I carefully energy balance all the muscles by massaging or touching certain energy reflex points that affect the meridian energy. This ensures I am testing the person’s reaction to only the substance in question. I then expose the person to the suspected substance — say, coffee beans — and test the reaction of the previously balanced arm muscle. If the person is sensitive to the coffee beans, they will not be able to hold the arm rigid against the slight pressure I exert. The arm will simply give way. The effect in practice is quite dramatic. If the person’s arm gives way on exposure to coffee beans, and if the coffee beans are then removed, the arm will test strong again. Muscle testing was first developed in the early 1960s by Dr. George Goodheart, a chiropractor. He called this new system Applied Kinesiology. Today lay-people as well as health professionals can learn some of the techniques for balancing and testing the body’s energy through classes in Touch for Health. This system was established in the early l970s by Dr. John Thie, another chiropractor. More than one million people, in at least 40 countries, have now learned this technique. These muscle testing techniques, along with the methods I have developed myself, have all been incorporated into a comprehensive health care system Health Kinesiology™. This system comprises methods for discovering and correcting energy disturbances from all currently known sources. These sources are not only from allergy and intolerance, but also emotional and psychological factors, and other environmental influences. While many health professionals today use muscle testing, they may not be aware of the special procedures required for precise allergy, nutritional, and psychological/emotional work. Qualified health practitioners can now receive training in Health Kinesiology. Muscle testing is an extremely sensitive technique for identifying the substances to which a person is allergic. 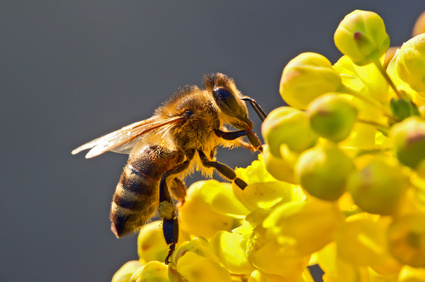 For example, through these methods I have found that many people are allergic to pollens — yet, many health-conscious people regularly eat bee pollen. Yet they wonder why they never feel up to par! Muscle testing can show that spring water is preferable to distilled water. (The heat of distilling water affects its energy quality). Thus, using muscle testing we are able to demonstrate that many foods and other substances that you may have thought were harmless or beneficial, are actually not good for you. Besides the foods and chemicals that disturb your body’s energy, muscle testing can identify the psychological and emotional factors that are unbalancing your energy and interfering with normal function. Muscle testing techniques also can distinguish allergy from intolerance, and can determine what the specific tolerance level is for a given food. The techniques of Health Kinesiology are not only more sensitive than other forms of allergy testing, but also easier on the person being tested. 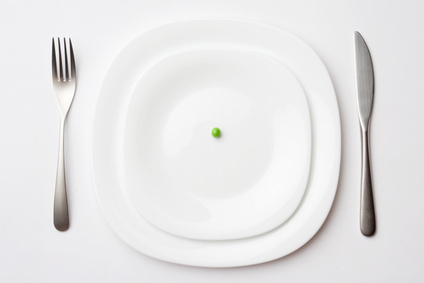 For many people, fasting is a difficult and uncomfortable means of identifying allergies; and, like many other allergy testing methods, it is very slow, taking weeks or months. 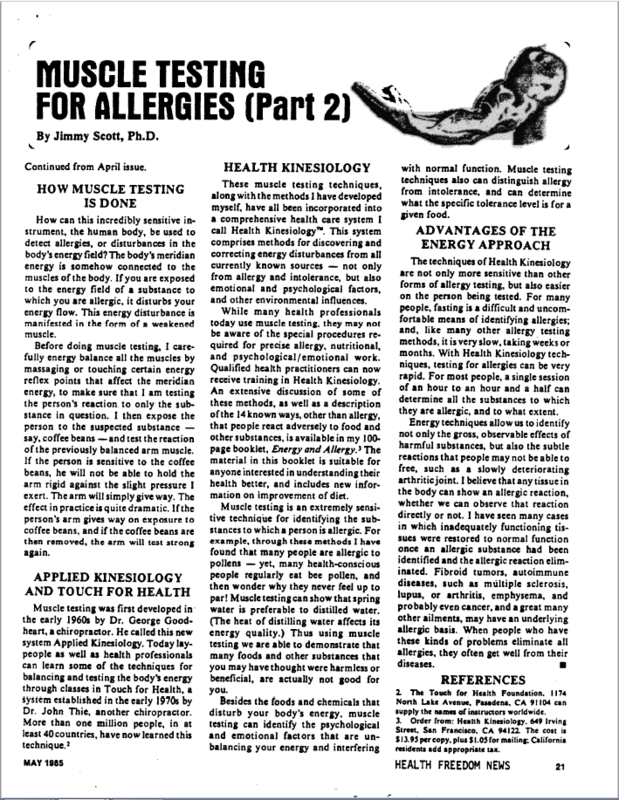 With Health Kinesiology techniques, testing for allergies can be very rapid. For most people, a single session of an hour to an hour and a half can determine all the substances to which they are allergic, and to what extent. Energy techniques allow us to identify the gross, observable effects of harmful substances, and also the subtle reactions, such as a slowly deteriorating arthritic joint. I believe that any tissue in the body can show an allergic reaction, whether we can observe that reaction directly or not. I have seen many cases in which inadequately functioning tissues were restored to normal function once an allergic substance had been identified and the allergic reaction eliminated. Fibroid tumors, autoimmune diseases, such as multiple sclerosis, lupus, or arthritis, emphysema, and probably even cancer, and a great many other ailments, may have an underlying allergic basis. 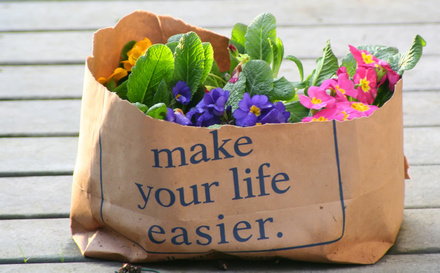 When people who have these kinds of problems eliminate all allergies, they often get well from their diseases. 1. An Alternative Approach to Allergy, Theron Randolph. M.D. and Ralph Moss. Ph.D., Bantam Books, New York, 1982.